General vegetation. Two subdivisions of the Sonoran Desert are present. Yellow = Lower Colorado River Valley; blue = Arizona Upland. The pink area is tentatively labeled Jojoba chaparral. About half of the Monument’s vegetation (35,000 hectares, 86,500 acres, 45%) is Arizona Upland subdivision (AZU) of the Sonoran Desert (Brown 1982). We classified most of the rest as Lower Colorado River Valley subdivision (LCV), though some botanists would classify much of it as AZU. There is an anomalous vegetation type near the summit of Silver Bell Peak in which jojoba is the dominant plant and forms nearly continuous stands. It also occurs in the Tucson Mountains, where Rondeau et al. (1996) seems to have included it in Arizona Upland. This vegetation has the physiognomy of chaparral and we tentatively classified it as such. 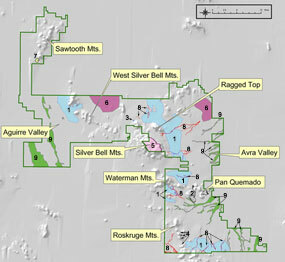 Jojoba chaparral covers 648 ha (1600 acres), 0.8% of the monument area. Ironwood Forest National Monument spans the transition between Arizona Upland and Lower Colorado River Valley. 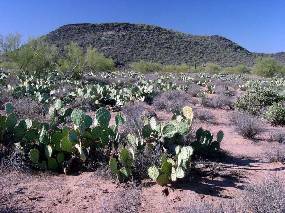 Arizona Upland is characterized by saguaros and legume trees growing on mountain slopes and bajadas (Shreve 1964). Intervening valleys are relatively narrow and also densely-vegetated for a desert, but ironwood trees and saguaros are uncommon because of killing winter frosts and excessively wet soils in rainy years. Arizona Upland is well developed in the Roskruge, Silver Bell, Ragged Top, and Waterman mountains (see gallery links in left column). Vegetation density and floral diversity are lower in the West Silver Bell Mountains and still lower in the Sawtooth Mountains. Some vegetation maps place the Sawtooths in LCV, but we labeled them marginal AZU because of the sparse cover of trees and saguaros on the slopes. The hotter, more arid LCV is characterized by low, rocky mountain ranges separated by broad valleys. The slopes of the ranges are usually devoid of both trees and saguaros because of the extreme aridity. Saguaros and ironwood trees grow on the lower bajadas and valley floors that, because of their lower elevation, are warmer than those in AZU. An additional reason is that the fine-grained soils hold more moisture than the rocky slopes. The trees in this hyperarid habitat are mostly restricted to drainages that concentrate runoff from watersheds. Avra Valley is the easternmost extension of LCV and is atypical. The valley floor is higher in elevation and is therefore both wetter and colder than other LCV valleys. Ironwood trees and saguaros are uncommon here; the washes are dominated by velvet mesquites and often contain blue palo verde trees. The Aguirre and Tat Momoli valleys on the west side of IFNM and the Santa Cruz Flats on the northern boundary are more typical LCV. 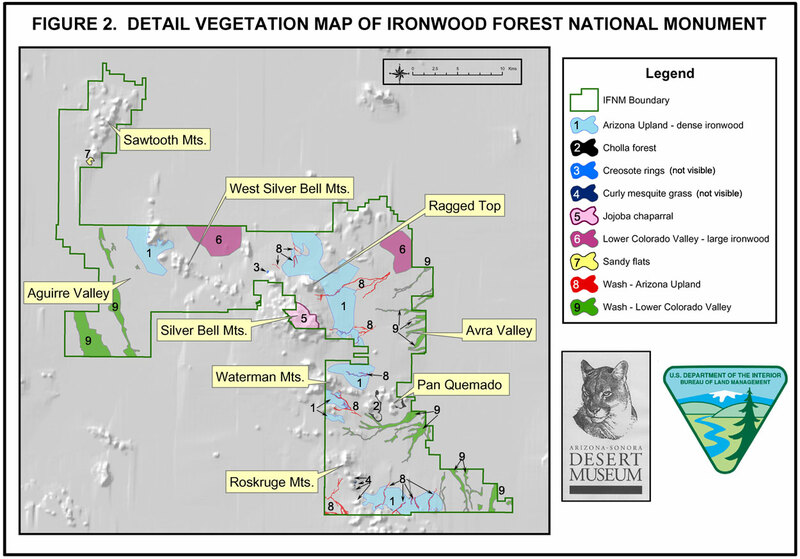 Trees, including ironwoods, are concentrated in washes and saguaros are sparsely distributed on the intervening flats. Important vegetation types. Full-sized image contains legend. 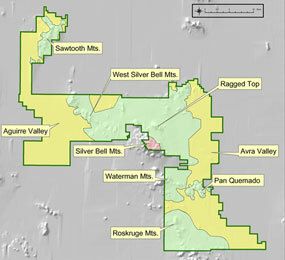 Several high-quality or rare vegetation types were mapped in detail. See links to image galleries at left and in thumbnails with the text below. 1. 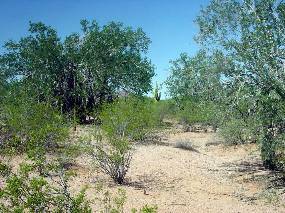 Dense Arizona upland: The heart of IFNM has large areas of well-developed Arizona Upland that includes dense groves of ironwood trees. 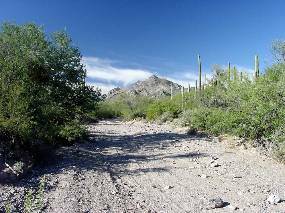 These areas also usually support above-average saguaro and foothill palo verde densities. 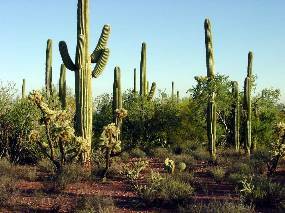 Additional dense saguaro stands occur in otherwise ordinary AZU vegetation. 2. 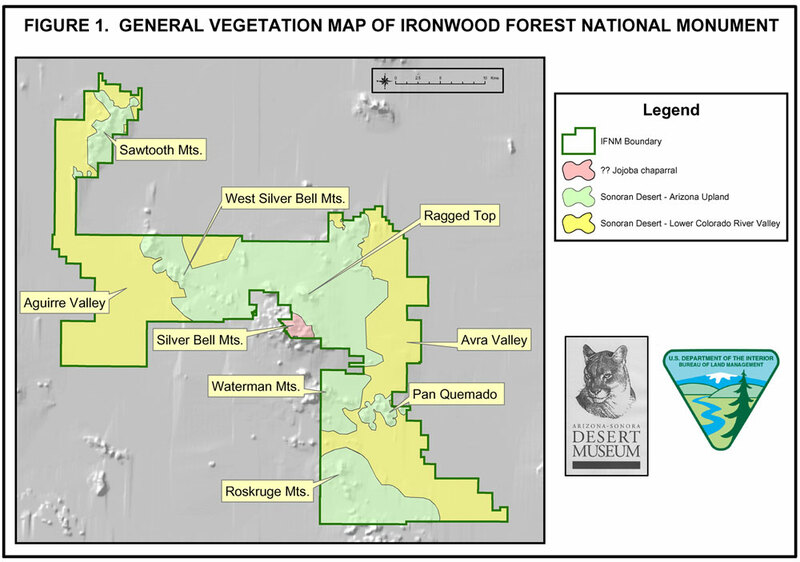 Lower Colorado River Valley with large ironwoods: The largest ironwood trees occur in drainages in the lower elevation valleys. Some are in braided washes or sheet-flooded areas that do not appear to be channelized on the ground. 3. Jojoba chaparral: Whether this is truly chaparral or an odd association within Arizona Upland, it is a rare vegetation type in IFNM. 4. Xeroriparian woodlands: Desert washes are identical to wetter riparian areas as to ecological functions; the only difference is that washes only occasionally have surface water. Like rivers, desert washes harvest water, nutrients, and seeds from watersheds and support greater densities of life than adjacent land. The larger washes support dense ribbons of trees. LCV and AZU washes are mapped separately (items 2 and 5 respectively). In Arizona Upland the trees are mostly ironwood and blue palo verde with some mesquite. A minority of AZU washes had an abundance of large ironwood trees. In Lower Colorado River Valley Sonoran Desert the washes are more variable. In some almost all of the trees are mesquites. Others are dominated by either blue palo verde or ironwood, or a mixture of all three trees. Desert willow (Chilopsis linearis) is also often present in LCV washes, but this species is conspicuously absent from Ironwood Forest National Monument. Washes are dispersal corridors for animals and plants (including exotic species). Tortoises occur mostly in bedrock uplands, but extend onto bajadas and even desert floors along rocky washes, especially those with caliche banks that readily form suitable shelters. Desert washes occupy a tiny percentage of desert habitat, and both plants and wildlife are concentrated along these narrow ribbons. The drier the area, the greater is the relative concentration. In the hyperarid desert of southeastern California as much as 90% of the biomass is restricted to washes No section of IFNM is that dry, but washes are nonetheless extremely valuable habitats. Because of the greater abundance of plants and wildlife, the availability of welcome shade, and the fact that they often provide convenient corridors for vehicle travel, people are attracted to washes. They are highly vulnerable to human disturbance despite the fact that they are regularly disturbed by flash floods. Vehicles, horses, and people on foot trample plants that establish in wash channels between the infrequent scouring floods. Animals are also disturbed; nesting birds are probably the most vulnerable to reproductive failure from repeated disturbance. 5. 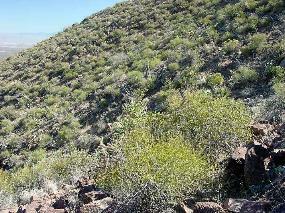 "Forests" of chollas and other cacti: There are several areas with dense stands of chollas. The largest is in the Pan Quemado Mountains, where an intermittent band of chainfruit cholla (Cylindropuntia fulgida) almost encircles the range. Other thick cactus patches are documented in the gallery, especially the saguaro forests. 6. Cactus dunes west of the Sawtooth Mountains: This small area is unique within Ironwood Forest National Monument and rare elsewhere. It consists of mostly flat, loose, pinkish sand densely vegetated with several opuntioid and other cactus species. Cacti are the codominant lifeform with foothill palo verde. Where a stabilized dune piles up against Wildcat Peak big galleta grass (Pleuraphis rigida) is also common. 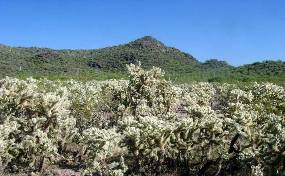 The only similar place we know of is the Cactus Plain near Bouse, AZ; that area has a much lower plant and cactus density and diversity.